Extreme pressures and temperatures in high-pressure common rail fuel injection systems are creating an all too familiar problem: plugged fuel filters and foul injectors. CarbonTreat™ Premium Winter Fuel Additives prevent and control the formation of asphaltenes and other unstable compounds. 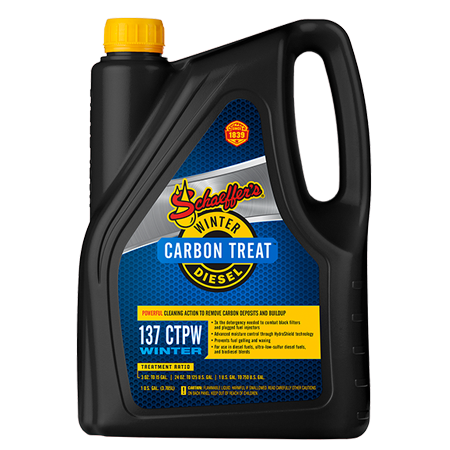 CarbonTreat™ is highly effective at combating soot and plugging issues that can rob your engine of horsepower and performance. By reducing the amount of soot from entering the exhaust system and even the DPF filter, CarbonTreat™ Premium Winter Fuel Additives help mitigate the downtime needed for DPF region. Using advanced water dispersant and anti-wax settling agents, CarbonTreat™ delivers unparalleled moisture protection in subfreezing conditions. This dual action technology eliminates potential icing and waxing issues, which increase the diesel fuel’s cold weather operability. CarbonTreat™ contains highly concentrated, multi-functional additive systems to improve fuel economy, reduce exhaust emissions and increase horsepower. Further blended into CarbonTreat™ is our proprietary lubricity additive, SynShield®, which prevents fuel system wear and injector scoring for longer component life. Developed for newer model vehicles, CarbonTreat™ can be used in any diesel-powered vehicles and in all types of diesel fuel, including ultra low sulfur diesel fuel and biodiesel blends. CarbonTreat™ exceeds cleanup and keep clean performance as shown by the Peugeot DW10 Injector Depositing Test throughout the entire fuel system. CarbonTreat™ is registered and meets US EPA requirements for blending into low sulfur diesel fuels. Improves fuel’s cetane rating – up to 5 points. Reduces soot generated in an engine's combustion chamber.